Are You Biding Your Time In EMS? Do you see EMS as a career? A profession worthy of education and dedication at the individual level? Or do you view it as a stepping stone. 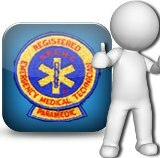 Recently there has been some discussion on two real sections of EMS. The ambulance drivers and the paramedics. Join us for our take on this along with more discussion on everything EMS. who decide where the profession is going. Take a listen to what is most likely the first in a series of discussions and start owning your EMS future. Pass the NREMT Using This Success Course. This week we talk about the part time EMS provider. The volunteer, the person who uses EMS as a part time income or because they enjoy the rush, the change from a desk job. Does this type of workforce help or hurt us as a profession? How does this demographic in EMS effect the supply and demand for employers? How does this all translate to those of us who depend on EMS for our livelihood? Take a listen as we are joined by guest David Brenner and leave your thoughts on our discussion in the comments below. Do you see EMS as a career? A profession worthy of education and dedication at the individual level? Or do you view it as a stepping stone. Recently there been some discussion on two real sections of EMS. The ambulance drivers and the paramedics. EMT, Paramedic or Just Driving Miss Daisy? Every once in awhile we like to talk about the whole ambulance driver name tag. Should we care and why? Does it matter and the perception that gets us there. But don’t we own part of the reason we are called Ambulance Drivers? With EMS Facebook pages touting Taxi this and shucking that, its no wonder we can’t shake the name. Plus the fact that the bulk of the call types we get really don’t leave us with much else to do but drive the ambulance. A sensitive topic for sure. Take a listen to this one and share your thoughts and suggestions on how we shed this brand we have made for ourselves once and for all. Shout out to Dave Konig for joining us in the chat room as well. Get details on how you can leave us a special message by clicking here for details. EMS In Five Years | Changes or Spinning Wheels? This week I am posting a replay of a very special interview done in 2008 with Rob Davis. Rob was a strong voice in EMS and sat with me to discuss the challenges facing EMS, what he felt was holding us back and how we could make changes to move the EMS profession forward. When I listened back to this audio I wondered how many things have changed in the years since this interview. Take a listen to this interview and post what you think is different between 2008 and now. Get your free customized trial of EMS Manager. Innovative and easy to use. Click here to begin. Time again for another monthly Rapid Fire episode where we will discuss popular EMS articles and topics in the news, on the blogs and general webosphere. Now I didn’t get to all the topics I wanted but we did have a lively talk about being called an ambulance driver, uniforms, perception <– yes again, and being vocal about your EMS system. Thanks to Tim Noonan, Bob Sullivan, Josh Knapp and John Broyles for joining me on the call. Thanks to all who took part in the live chat as well, you made great points that kept the show going. Join Josh on Facebook click here. This weeks live podcast “We Want Steak But Settle For Spam” tried to answer the question on why when it comes to EMS, it seems we pay more attention and put more energy into topics that really won’t help us as professionals? Like Spam that special meat that satisfies for the moment but not what we really want. It seems more commentary is given to whether we are called ambulance drivers or EMT’s rather than focusing on topics like intubation success, the drugs we use and treatments we give. Sure it’s out there. Just like that nice T Bone steak or fresh lobster. But we settle for the Spam, the stuff that just gets us by, not what really matters and not what we should want as a profession. I wonder what’s your opinion on why this is. What can we do to start targeting the real issues facing the EMS profession?